DryPhoneCase® protects your smartphone everywhere you go. Rafting in wild waters, hiking in the mountains, skiing or working around the house. 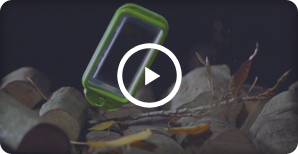 DryPhoneCase® is shockresistant, dirt repelling waterproof and airtight. It even lets you use your phone under water! With the DrySmartPhone® case it only takes a moment to convert your smartphone into a fully functional underwater camera. Simply strap in and create sharp underwater videos and images in depths up to 2-5 meters! Don’t worry about dropping! The airtight case will allways float to the surface. Driping liquids and dirt are not a challange for the DryPhoneCase®. Protect your smartphone from damage and moisture in the wilderness while hiking, or at any water related activity like rafting or sailing. DryPhoneCase® isolates your device from the snow and cold while protecting against shock damage. Shoot awesome videos and pictures, keep in touch with the rest of the gang and feel safe while using GPS in the mountains. Know your phone is protected from damage and spilling paint while working around the house, in the garden, the garage or professionally at a construction site. DryPhoneCase® cases are all produced in a manufactory in Italy. We submit all cases to a water leak test. In fact the production line itself is an airtight test, using high-tech equipment unique in Italy. No DryPhoneCase® case is sold without having passed the conformance tests! Further on DryPhoneCase® cases have been tested and approved by an independent certifier and certified to be completely waterproof up to 2 meters and 30 minutes. Read the report here! DryphoneCase in action. Watch now! Putting some stress on our cases in this spectacular video. © 2013 Trade&Trends Ltd. All rights reserved.